Carving pumpkins is a tradition that goes back for years — maybe even decades. I don’t know, I’m not a historian. The idea is that you put a jack-o’-lantern on your porch to scare away trick-or-treaters and protect your candy hoard. But today’s tech-savvy kids are no longer frightened by pumpkins with toothy grins lit by tea lights. That’s why you need to step up your game and build animatronic singing jack-o’-lanterns if you want to keep your candy safe. 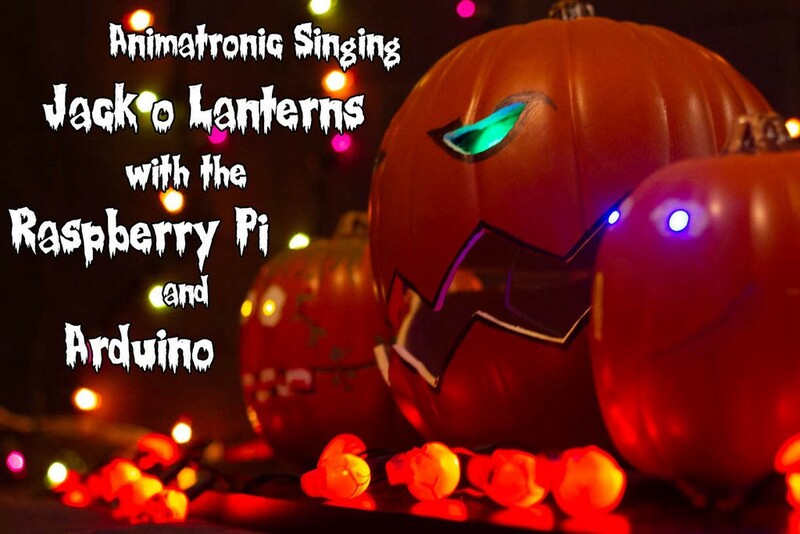 This tutorial from Fadecomic, AKA Timothy Holt, will walk you through how to build a set of three animatronic jack-o’-lanterns that sing along in sync with all the Halloween classics. They’re controlled over the internet with a Raspberry Pi and Arduino, and have some glowing eyes for a little extra spooky flair. For reasons of practicality, and to avoid grossness, it’s best to use foam or plastic pumpkins instead of the real deal. The goal is to scare kids away, not make them sick when they see rotting pumpkins. The animation sequences are created in Vixen, which is free software. They’re played through Falcon Pi Player, which runs on the Raspberry Pi. The music is output directly to from the Raspberry Pi to amplified speakers, while the lights and servos are controlled via the Arduino. There is a lot of flexibility in this setup, so you can tailor it to your own tastes — Falcon Pi Player even support GPIO input events like button presses. The important thing is that you hurry up and build yours in the next few hours if you want to protect your candy from the trick-or-treaters tonight. These Jack-O’-Lanterns Were Brought to Life with a Raspberry Pi and Arduino was originally published in Hackster Blog on Medium, where people are continuing the conversation by highlighting and responding to this story.